Patricia Ann Priest Hansing is a former actress and currently owns an antique store with her sister in Boise, Idaho. 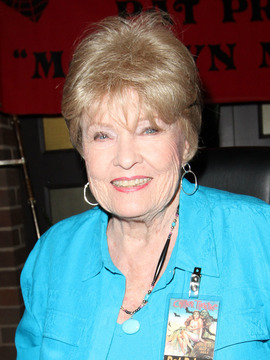 She is best known for her role as Marilyn on the television show “The Munsters.” She is a member of The Church of Jesus Christ of Latter-day Saints. Priest married White House Navy Aide Lieutenant Commander Pierce Andrew Jensen on August 20, 1955. When he was stationed in California, Priest pursued acting. She appeared in many commercials for Rice Krispies, Purina Dog Food, and others. After the birth of her two sons, she debuted in the 1964 film “Looking for Love,” which starred Connie Francis, Johnny Carson, Danny Thomas, George Hamilton, and others. She had other roles in “The Jack Benny Program,” “Quick Before It Melts,” “Voyage to the Bottom of the Sea,” “My Favorite Martian,” “Death Valley Days,” “Perry Mason,” and “The Lucy Show.” Her big break came when the actress who played Marilyn Munster decided to leave the show and Priest was picked to replace her. She played the role for the run of the show. She and her first husband were divorced in 1968. She remarried Frederick Hansing in 1981 and they moved to Hailey, Idaho. She survived a bout with lymphoma in 2001. She now lives in Eagle, Idaho. This page was last edited on 26 December 2014, at 20:58.